Illustration of tidal interactions. From ftp://ftp.osupytheas.fr/pub/symposiumCOROT/posters/Francoise-Remus-Poster.pdf. I attended a talk at the US Naval Observatory on Friday given by newly minted Dr. Françoise Remus of the Paris Observatory. Remus discussed tidal interactions between the Jovian or giant planets and their satellites. Tides are well known here on Earth, where the Moon raises tides in the oceans on a regular basis, as seen in the Chesapeake Bay. The moons of Jupiter and Saturn also raise tides on those planets, in the planets’ atmospheres and deep interiors. The tides raised on these planets interact gravitationally with the satellites and influence the moons’ orbits, as for the Earth’s Moon — tides on the Earth push the Moon away from the Earth a few centimeters every year. On Earth, drag in the oceans provides tidal dissipation that drives the Moon’s orbital evolution. Tides raised on Jupiter and Saturn apparently also experience dissipation, but since those planets don’t have shallow oceans, it’s not clear what generates the dissipation. 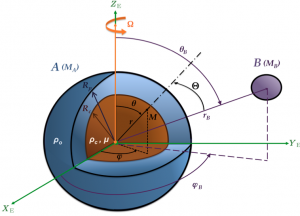 For her graduate work, Remus created complex models to explain tidal dissipation within Jupiter and Saturn and showed that the planets’ rocky and icy cores, deep within their interiors, play a key and previously under-appreciated role. Her work has broad implications, from helping us understand these planets’ mysterious interiors to explaining the origins of the planets’ complex satellite systems. Good talk today from one of our own, Dr. Jackie Faherty, a Hubble fellow here at Carnegie. 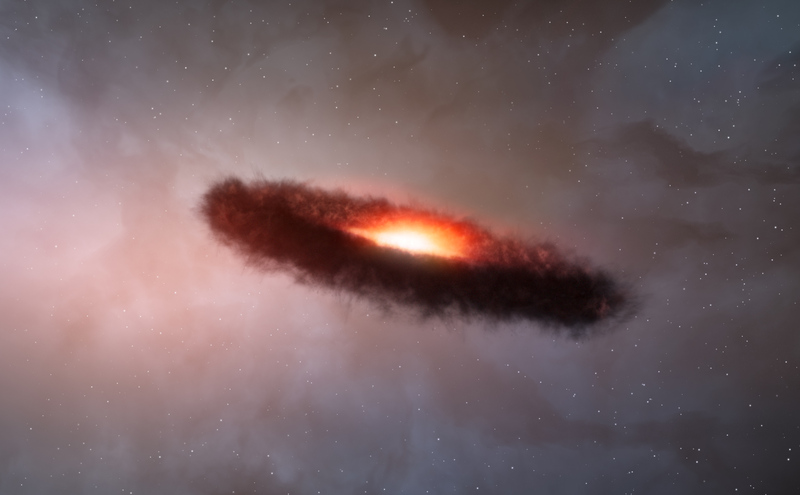 Artist’s impression of the disc of dust and gas around a brown dwarf. From http://en.wikipedia.org/wiki/File:Artist%E2%80%99s_impression_of_the_disc_of_dust_and_gas_around_a_brown_dwarf.jpg. Faherty talked about brown dwarfs (BD), a relatively new class of astronomical object that straddles the border between planets and stars. Brown dwarfs typically have masses between 13 and 75 times that mass of Jupiter and are made mostly of hydrogen gas, with lots of complex and interesting molecules mixed into their atmospheres. Faherty studies the motion and distances of BDs using an age-old technique called parallax determination. It is very important to accurately estimate the distance for a BD because combining that estimate with measurements of a BD’s brightness and temperature gives a sense of the BD’s age — critical for understanding how BDs evolve over time. BDs exhibit a bewildering variety of compositions and evolutionary behavior — some have variable clouds and weather — and the field is moving very rapidly. For example, astronomer Ian Crossfield just this year produced the first image of a BD’s atmosphere. And, in her talk, Faherty highlighted important similarities and differences between BDs and gas giant planets and showed how they may help unravel the mysteries of planet formation. Posted in: DTM Astronomy Seminar, Uncategorized. A slice from a high-fidelity model of the Solar System, viewed face-on from the outside. Image credit: M. Rizzo / A. Roberge from http://asd.gsfc.nasa.gov/projects/haystacks/haystacks.html. Great talk today from Ashlee Wilkins, a grad student at University of Maryland Astronomy working at NASA Goddard, about imaging dust disks and planets around other stars. Many stars, including the Sun, are surrounded by dust grains in disks, usually produced by collisions between asteroids and other larger bodies orbiting the stars. 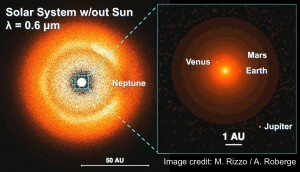 The orbits of these dust grains can then be shaped by gravitational interactions with planets in the system. Because the disks are much easier to observe than planets in these systems, they can provide clues to the presence of the otherwise unseen planets. Wilkins and her collaborators are working to make very sophisticated models of such disks to learn what the disks would look like so that we can design telescopes to directly image planets in such systems. 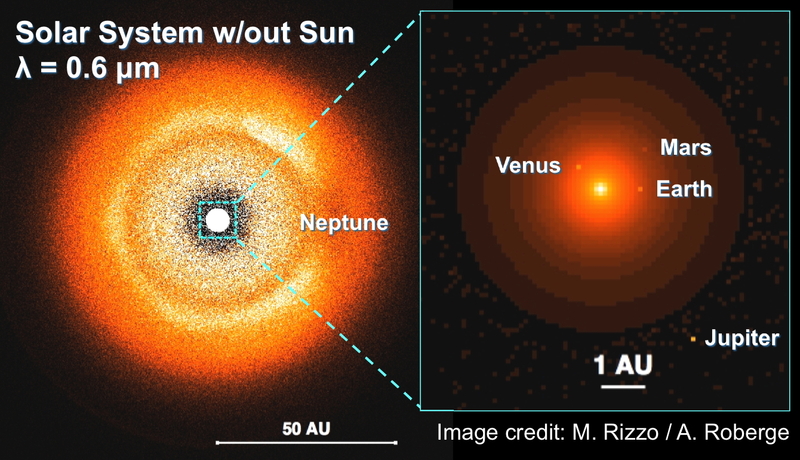 The image at left shows what our solar system might look like to astronomers on a distant planet, as produced by such a model. Wilkins is also helping to build the instruments that could directly image an Earth-like planet in a distant solar system.